Delivered September 2012-Grand Rivers, KY “WORK BOAT SPECIAL” 60’x24’x8′, Twin Cummins QSK19-M diesels @ 500 HP each, Twin Disc MGX 516 Marine Gears, 60″x52″x4 Blade Props, Twin John Deere 40 Kw Gensets, Approx. 8,000 Gal. Fuel Capacity, Approx. 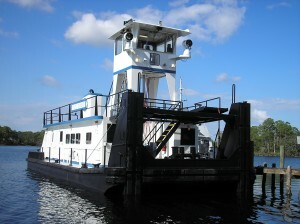 800 Gal Potable Water, Two Air Compressors, Twin 40 Ton Winches, Galley and Head for Crew.